Not much done this weekend due to most of it spent preparing DS for life away from home, uni-style!!! Teamed with Robert Kauffman’s Kona Cotton Solids in Snow, I can’t wait to see each block each month. You can join in too……it’s a free BOM which you can register for here. Two new blocks on the first of each month…..sweeeeeet! Even I can handle that! 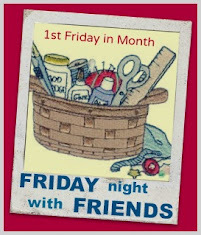 Next month, why don’t you join me on the Friday Night Sew In too? Read all about it here and we’ll see what finishes we can both get done! Mmmm, I like those blocks and I can remember sitting watching the original Grease too! Must have been fun watching your friend's daughter performing! They are going to be cute blocks!